The shoes were cute, although I had to go up a half US size in order to get the width I needed. One of my foots is wider than the other, and the other is slightly longer that the wider foot. It makes shoe shopping an annoying experience for me. 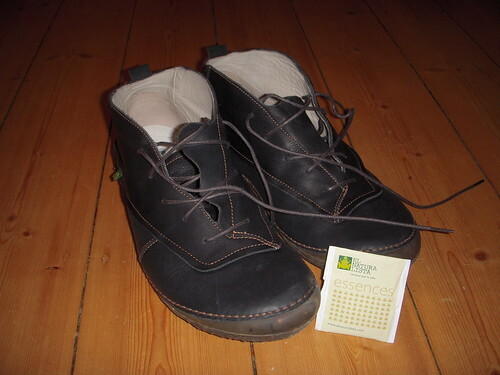 The oddest thing about this pair of shoes was that it came with a tea-bag in the box: a blend of Lemon balm, Lime blossom, and Lemon verbena. I haven’t tried it yet, but I cannot help but wonder how well the citrus flavors compete with leather. I tried some tea that came with shoes I once purchased. It was some weird variety called “silica” and it tasted terrible. they carry this brand at our karstadt. wanted to try on a pair (similar to those actually) this morning, but they were on sale because there weren’t many pairs left and i was out of luck size wise. enjoy them – all of their shoes look really comfortable! @ann: There’s supposed to be an El Natura Lista shop in Berlin, perhaps if you can make it up there, you might get lucky.